It's "through" you douche. Also, quit voting for yourself so your comment comes up... after editing it 3 times. this tattoo could really mean something to her. she could of lost a baby and this tattoo could be representational of that. AM I REALLY THE SECOND PERSON TO REALIZE THAT THIS BABY IS JERKIN IT?????! This is amazing. Not fail. WIN. why are the feet backwards???? Ahh, the best aphrodisiac. Wait...did I say aphrodisiac? I meant plan 'C' birth control. I agree. She could HAVE lost a baby and this a tribute. Really creepy....but I cannot see a tattoofail?? 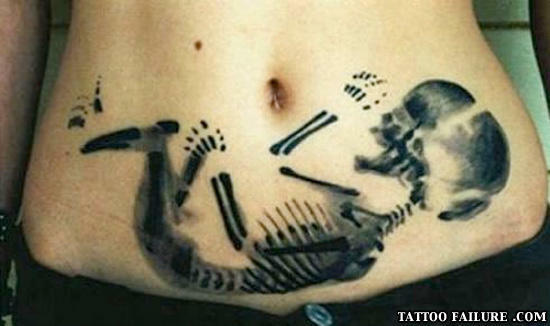 this tat is awesome... it looks like a real X-ray! I'd hit that. In the face, i mean.